Over the past day, Russia-backed militants 25 times attacked the positions of the Ukrainian army along the line of contact in the zone of the antiterrorist operation (ATO) in Donbas, the ATO press centre reported on Facebook on 23 November . 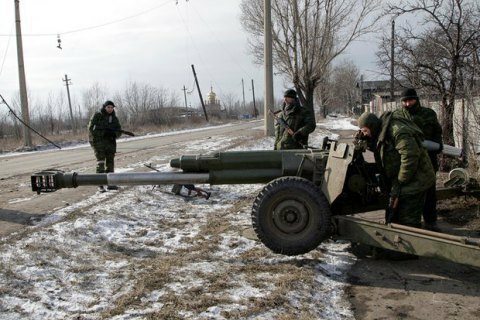 In the areas of Shyrokyne, Taramchuk, Vodyane, Krasnohorivka, Maryinka and Talakivka, the militants fired mortars of various calibres, rocket-propelled grenades and small arms. Novotroyitske and Pavlopil came under sniper fire. In the area of Krasnohorivka, the militants used a light portable rocket system Grad-P (Partizan). In the Donetsk sector, the enemy used mortars, rocket-propelled grenades and small arms in the areas of Avdiyivka and Zaytseve. In the Luhansk sector, the ATO troops based in the areas of Novozvanivka and Novooleksandrivka were attacked with mortars, rocket-propelled grenades and small arms. "A total of 25 attacks took place, and four since midnight," the HQ said. No casualties have been reported among Ukrainian troops.